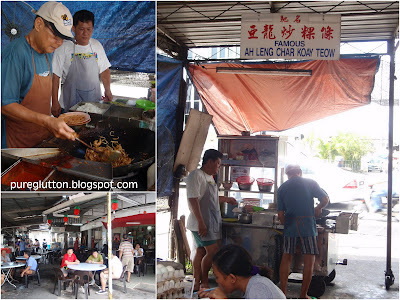 Continuing our food jaunt in Penang… the next morning found ourselves back in Gurney Drive again. Of course the day scenes there are very much different from the glitzy lights the night before. It was a wet morning – the early morning drizzle had somewhat “cleaned” the hazy air and it was really refreshing taking a walk along that popular road as we headed to our targeted breakfast venue No.1. After reading CK Lam’s post on the delish morning fare found in Song River Cafe, we wasted no time in heading there. 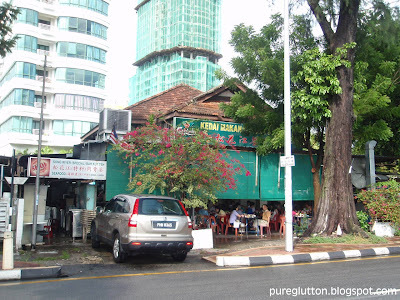 This well-known cafe, located at No.65 Gurney Drive, was already filled with hungry folks when we reached the place. 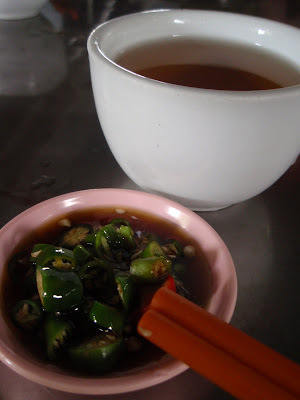 Chinese tea & chilli padi all ready while waiting for the food to arrive! 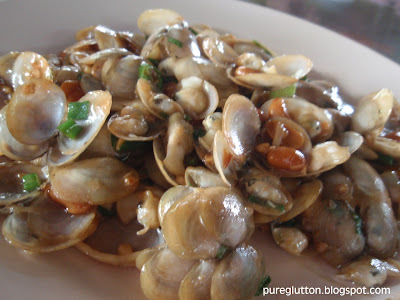 The first dish of Baby Clams (Lala) came very quickly. These tiny morsels were so fresh and sweet-tasting that they were polished off in less than 5 minutes, I kid you not! Lightly saute’ed in whole taucheo beans, chilli padi and ginger, these baby clams did nothing to fill our tummies – in fact, they made us more hungry than ever, if that’s possible! Yeah, catalysts for our appetites! 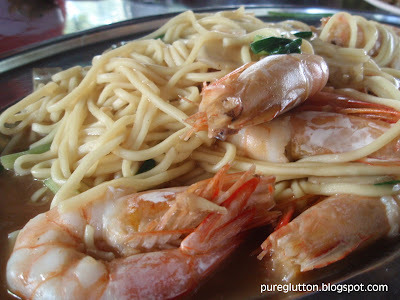 It was just plain old yellow noodles cooked in nothing but huge fresh prawns and some spring onions… yet, the flavours were so tantalising & yummy. 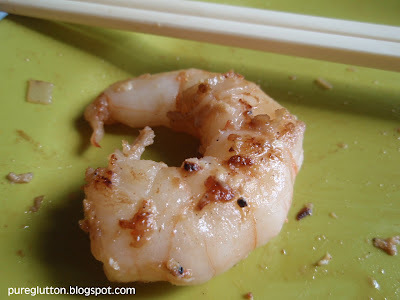 They certainly do not stinge on the prawns – top-rate quality ones, I assure you. Just look at the size lah! And half-peeled for us too! 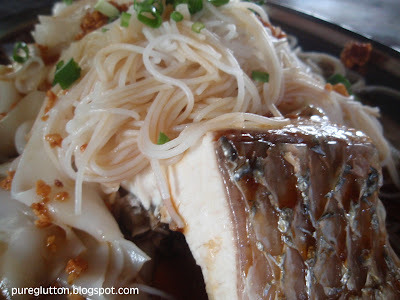 In fact, “excite” does no justice to the plate of Steamed Fish with Noodles which appeared next. It certainly did more than excite! 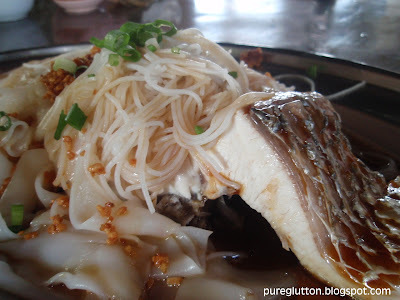 We chose siakap fillet … which was hidden underneath a pile of beehoon and kwayteow. Again, it was the freshness and simplicity of the ingredients which made this a clear winner. 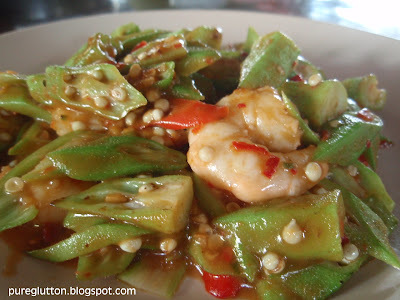 With only soya sauce (of superior quality), fried garlic and toppings of spring onion, somehow the chef in Song River has done a miracle in producing a dish that’s sooo delightful that…. …. we just had to order another one! Yes, one plate was not enough! We ordered a second plate but this time opted to have just only kwayteow because we liked that better as kwayteow were way smoother and softer than beehoon. … until our 2nd plate of heaven came… which was just as good, if not better than the 1st one. The Law of Diminishing Returns does not apply at all, ok! 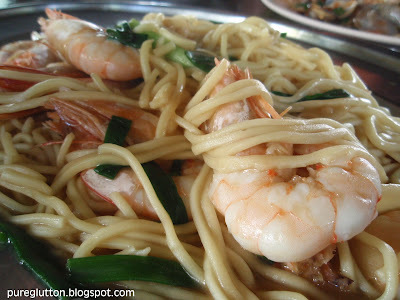 Good quality food comes with a price… that meal above for 4 of us came to about RM145. Certainly not a cheap breakfast… and that was only just Part 1. After some frantic sms’ing with CK Lam who highly recommended Ah Leng Char Koay Teow on the exact location of the place, we managed to find it with the help of our GPS. 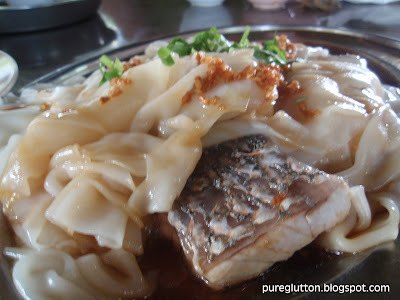 According to CK Lam, this CKT is one of the best in Penang – read about her post here. Within minutes, our first plate of CKT was placed on our table. 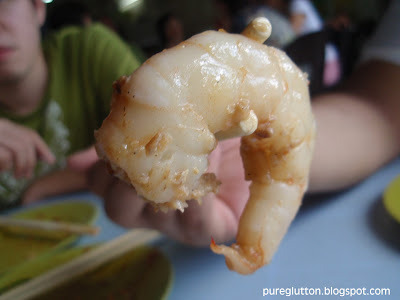 The speciality here is the Mantis Shrimp… there, can you see the caterpillar-like chunks? Those are the peeled mantis shrimps… fresh out of their shells! Mmmm… this was MY plate… see the small mountain of cockles by the side, hehe… those were kindly donated by NL who’s not a cockle-fan. Now, if this plate of heaven doesn’t raise your bad LDL levels some serious notches, I don’t know what will! The amount of mantis shrimps, prawns, eggs and cockles (quadrupled whammies, man!) 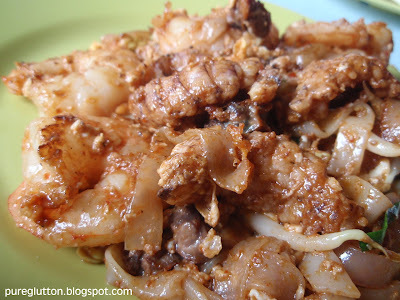 totally overwhelmed the koayteow… so if you’re a carbs fan, I think you have to tell the guy to tambah koayteow for you!! 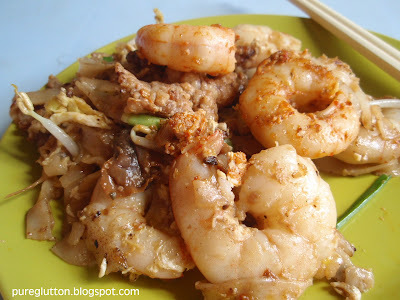 All the sweet briny flavours of the mantis shrimps and fresh prawns have been imparted and totally absorbed by the rice noodles, fanned by the wok-hei. 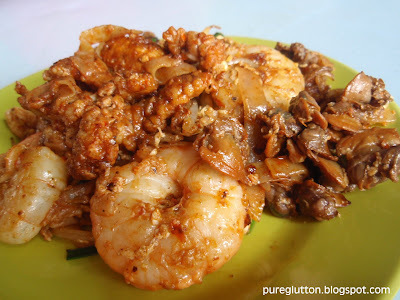 With all the super ingredients thrown it, it’s not surprising that the price of this CKT is RM9 a plate. Yes, not cheap … but then you pay for the quality and experience. LL had double plates… so in total we had 5 plates! And that… was our 2nd breakfast for the day … all done before 11.00am! Look out for what we had next…hehe! Next post! btw HDL is the good one. LDL is the bad one. 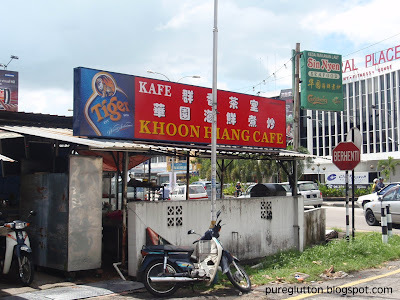 CKT in Penang is on a whole other level, i tell you …. so, so satisfying. hahah… the song river one is really good! i luv those baby lalas! In KL cant find? so far i havent been successful.. so this was your new car break-in drive?? Allie: Eh, must remind ka? Hehe…ok, faster go makan! J2Kfm: Ok, thanks for pointing that out, haha! Corrected it oredi. Ya Pg CKT has its own "chun-ness"! TNG: Can get those baby lalas in our wet markets here but not so readily available in the restaurants, except for Klang/Port Klang. Penang's such a sinful island I tell ya. All those dishes in the first part and you all can continue on for second round…respect! Please type down the GPS cordinates in your blog. TQ. 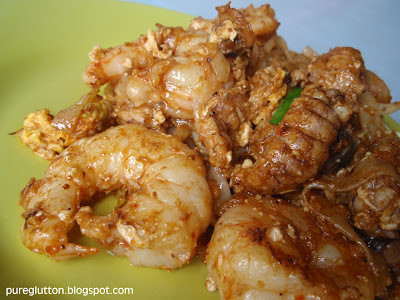 now this i exactly what I'm looking for…Penang food!! 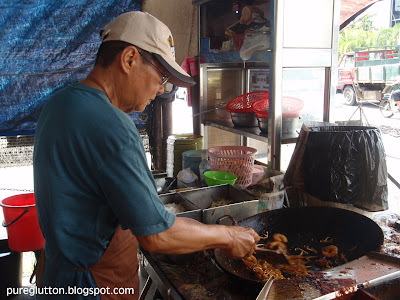 You Penang ppl are so lucky – can go and wallop the CKT anytime, lol! 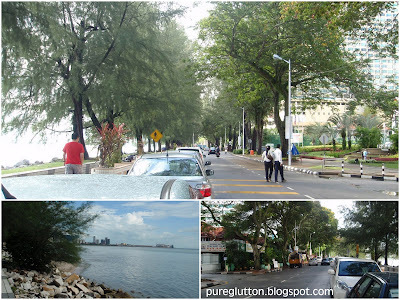 BBO: Indeed, Penang qualifies as that! Hi WongSF: Err… will try to remember that in my next post! 550ml: Yeah, i would love to repeat that myself too, LOL!